With a close conversation with one of the reporters on Annual Brand Vision Awards, Kartik Aaryan revealed saying that he will be spending his Valentine Day with his mom as he doesn't have any Valentine. He further shared a picture with a skeleton on Instagram, calling it his Valentine. Is Kartik Aaryan spending Valentine's Day with Sara Ali Khan? It seems that Kartik Aaryan, masters the talent of impressing his fans especially girls with his adorable smile and phenomenal acting. A few hours back, the actor also uploaded a cute video with his fans wishing them Happy Valentines day. Some time back, the actor was in limelight, ever since Sara Ali Khan talked about him on Koffee with Karan. As per reports, it seems the national crush Kartik will celebrate his valentines day with his mother. Annual Brand Vision Awards which happened just a few days back revealed something very big. On being asked by a reporter at the award function about his valentines day plans, Kartik replied laughing and said he will celebrate his valentines day with his mother. He further said that he will not attend any party on the day as he doesn’t have a partner. 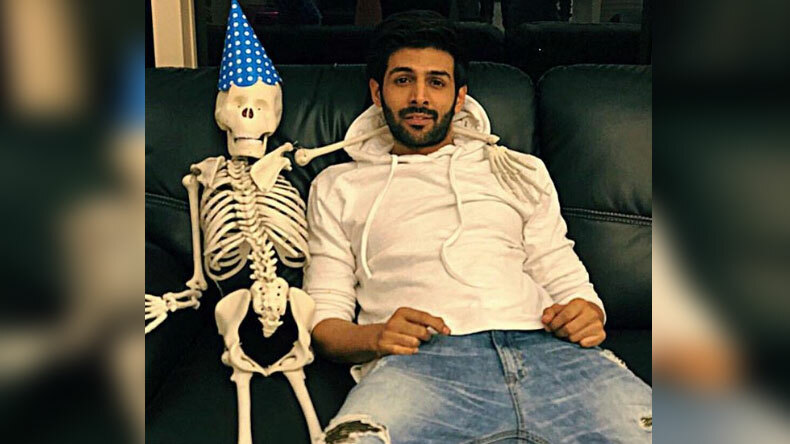 The actor also shared a picture with a skeleton on Instagram and captioned it calling the skeleton his date. Prior to this, on the trailer launch event of Luka Chuppi, Kartik Aaryan mentioned that whenever he is in a relationship, his mother knows everything about it and oftently becomes friendly with his girlfriends. If something wrong happens, she still maintains the same friendship level with his exes. He further revealed about his super favourite song from the film Luka Chuppi and shared it on his official Twitter handle with a sweet caption.